and drew the ball away from the perpendicular. Guess who else studied the deflection of projectiles? caused by rotation of a body while moving through the air. for aircraft and boats in World War I. He designed helicopters in World War II. escorted her and her family safely to Sweden. and might still be the aircraft of the future. Some sources say the effect is caused by the deflection of the wake, and others say it is caused by a difference in pressure perpendicular to the direction of flight. If you could eliminate turbulence around a moving body, you would save a lot of energy. 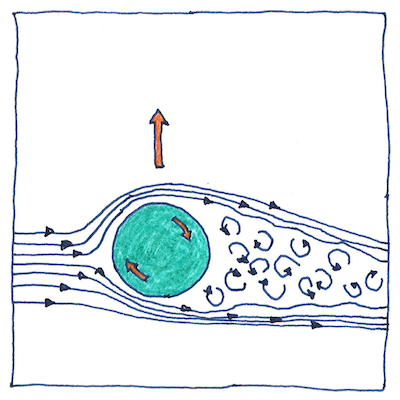 Turbulence at its tail slows a projectile more than the force of air at its head.